Dakota Ridge Articulation Area student researchers from Mt. Carbon assemble their Ladybugs in Space SSEP experiment. April 19, 2016 – Students at Mount Carbon Elementary School in Littleton, Colorado have been conducting a real-world science experiment to see how ladybugs will survive in space. The recent launch of the SpaceX CRS-8 mission on April 8 carried the ladybugs to the International Space Station as part of the Student Spaceflight Experiments Program (SSEP) Odyssey II payload on April 8, 2016. 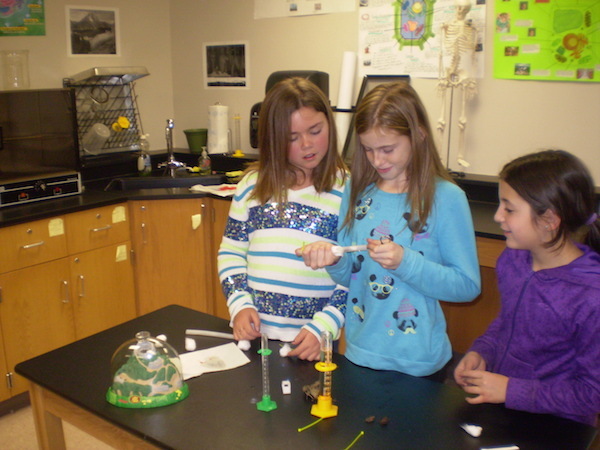 Student scientists engaged in the experiment include Kylie Dappen, Maddison Gargiulo, and Meghan Simpson. Their teacher facilitator is Pamela Laidley. For the experiment, the group chose to show how micro-gravity will affect the life cycle of a ladybug. While the experimental group of ladybugs are in space, a control group is being nurtured on the ground. The students will compare the two groups of ladybugs after the mission returns back to Earth. The outcome of the experiment could be important to future human space exploration. Experiments are currently being conducted to learn how best to grow food for space missions and the possible colonization of Mars. Ladybugs are invaluable to farmers on Earth who use them to control aphid populations without the use of harsh chemicals. An infestation of aphids can decimate crops, but a single ladybug can eat up to 5000 aphids. If the students conducting this experiment are right, the ladybugs in space will have a somewhat faster lifecycle than ladybugs on Earth, but they’ll still be useful for farming in space. SSEP makes use of microgravity research mini-laboratories that NanoRacks, LLC, schedules to fly in low Earth orbit. Each mini-lab contains a single experiment, and multiple mini-laboratories are carried to orbit in a payload box. NanoRacks makes the same mini-laboratory available to the Student Spaceflight Experiments Program as to professional research communities in government, academia, and industry. SSEP student flight teams might therefore share the space in the payload box with mini-labs flown by the professional research community. SSEP is designed to inspire and engage America’s next generation of scientists and engineers by providing each participating community their own very real Space Program. In each participating SSEP community, as part of the Flight Experiment Design Competition, student teams design microgravity flight experiments and submit well-crafted, formal proposals that are written to criteria defined in the SSEP Flight Experiment Proposal Guide. Students can design experiments in diverse fields, including: seed germination, crystal growth, physiology and life cycles of microorganisms (e.g. bacteria), cell biology and growth, food studies, and studies of micro-aquatic life. Proposals go through a 2-Step review process, with the participating community assembling a Step 1 Review Board of local area educators and researchers that selects 3 finalist proposals. The finalist proposals are forwarded to the SSEP National Step 2 Review Board that selects one flight experiment for each community. There were a total of 2,521 proposals submitted from student teams across the 24 communities participating in Mission 7 to ISS. Of those, 898 proposals were forwarded for review by Step 1 Review Boards in each of the communities. Each Step 1 Review Board selected three finalist proposals, which were submitted to the National SSEP Step 2 Review Board. It’s noteworthy that the 2,521 proposals received reflected a total of 10,760 grade 5-12 students fully engaged in experiment design. Once accepted, all flight experiments underwent a NASA Flight Safety Review and passed; flight experiment teams continued to optimize their experiments until the experiment lock-in for flight date. This was SSEP’s 9th flight opportunity to fly student experiments to Low Earth Orbit since 2010. The SSEP Odyssey payload was originally aboard SpaceX CRS-7 which launched on June 28, 2015, and exploded 2.5 minutes after launch with loss of all experiments.